The average non-Chinese person looking at Chinese characters may well think they are a mass of lines and squiggles which are impossibly difficult to fathom. According to Wikipedia there are 47,000 + characters in the Kangxi dictionary whilst this blog claims that there are in excess of 80,000 characters – a truly daunting prospect for a learner of Chinese. Moreover, there is some disagreement as to the number you need to know in order to read a newspaper depending on which source you consult. The HSK (Hanyu Shuiping Kaoshi – the People’s Republic of China only standardised test for non native speakers) at advanced level is based on approximately 2,600 characters giving a total vocabulary of about 5,000 words. 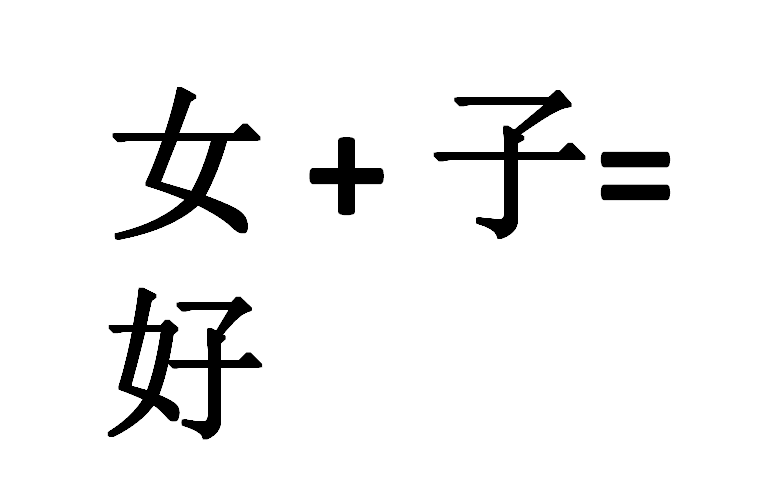 Learners of Chinese will know however, that the characters are made up of building blocks or components called radicals of which there are just over 200, so what at first might seem impossible to fathom actually can be decoded more easily once these have been learnt. I’ve just recently come across Cracking the code website which offers learners a useful way of getting to grips with characters and how they are built up. This site breaks the characters down into components which are classified as being derived from humanity, nature, culture abstract or “other”. These in turn are broken down into further subcategories. “Nature” for example is categorised into ‘earth’, ‘heaven’, ‘plants’, ‘animals’ and ‘animal parts’, each of which is then further subdivided e.g. “earth” components include those for earth, field, gold, jade, stone, mountain, hill, cliff, cave and valley. Clicking on one of these individual components then brings up a screen showing details of that component. This includes the meaning, a sound file, the number of strokes needed to write it, its “radical” number for the purpose of looking it up in a dictionary and a list of characters where it is used in combination with another radical. The learner can then click on one of these characters to get the sound file and an explanation of the breakdown of the character and how they combine with other characters to create new words. The site is easy to use and would be particularly useful for a learner with a basic knowledge of the most common radicals wanting to increase their vocabulary. The one thing it does not seem to have are animated characters showing the stroke order, but these can be seen on the Nciku dictionary site. One of the real bonuses of having PGCE students working with you is that they often come up with fantastic resources and creative ideas for using those resources. This song from the Lassie Singers is just one example and was used in a lesson I observed. 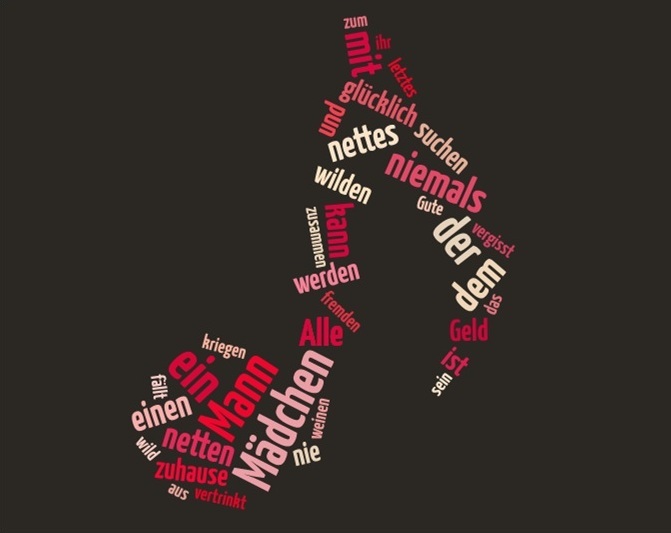 The lyrics are perfect for introducing relative clauses in German as well as for looking at adjectives and adjectival agreement. Pronunciation – does it matter? If you are a teacher you’ve probably heard that question dozens of times; does it matter if you don’t spell it right, does it matter if the grammar’s wrong, does it matter if you don’t say it right? Of course the answer will depend on the context. What are they trying to do? Have they been able to communicate even if there are mistakes? Are we trying to build their confidence and fluency, in which case we might let a few errors pass. If our learners get too hung up on getting things right all the time they won’t experiment, take the risks and develop the skills of being creative language users. If they are aiming for A* in their written controlled assessment at GCSE then it almost certainly will matter more – they will at least be expected to use their dictionary to get details such as spellings and genders. When it comes to speaking there used to be that concept of the “sympathetic native speaker”, but how sympathetic can we be? Grammatical errors, the wrong words and mispronunciation can all get in the way of communication. When teaching Chinese correct pronunciation takes on a whole new dimension because of the different tones, as we discovered in class yesterday when confronted with tāng and táng, the former meaning soup and the latter sugar or sweets – could make for an interesting meal if you get it wrong. For learners of Chinese there are a couple of useful sites that can help them work independently to “tune” their ear into the different sounds of Chinese and learn to distinguish between the various tones. New Concept Mandarin has an introduction to Pinyin with a table where you can click on any combination of initial and final and get the sound for each tone; this is also represented visually. There is something similar on Chinesepod, where they make the point that you can’t read Pinyin, just as you would English, something which learners find confusing at times. Chinesepod also has all the sound files in downloadable form which can be useful if you are putting together resources. My learners often ask me the Chinese use Pinyin; the answer is that they don’t, at least not apart from when they first start to learn to read. Pinyin was developed as a way of increasing literacy amongst the Chinese population and certainly helps us non native speakers get into the language faster than we would do otherwise. 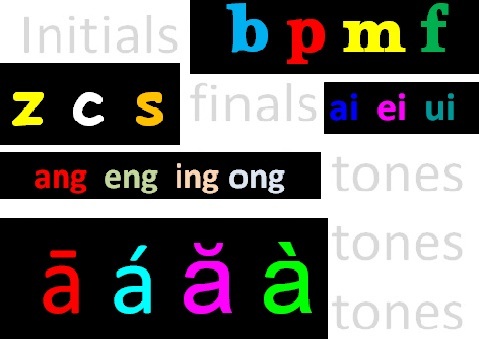 Another resource which I’ve just come across is this song (also accessible from the Chinese songs page) which groups the initials and finals together by similar sound; it then moves on to the tones. 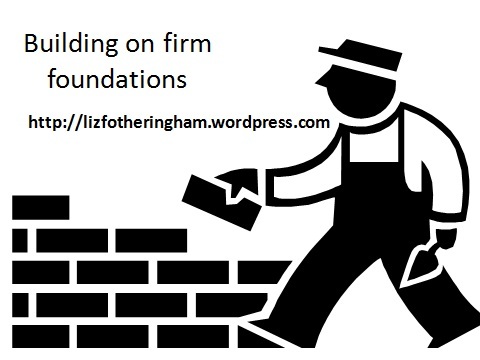 I could envisage developing some actions to go along with it…. Actions associated with sounds is at the heart of Rachel Hawkes’ philosophy of teaching phonics early in the language learning process. 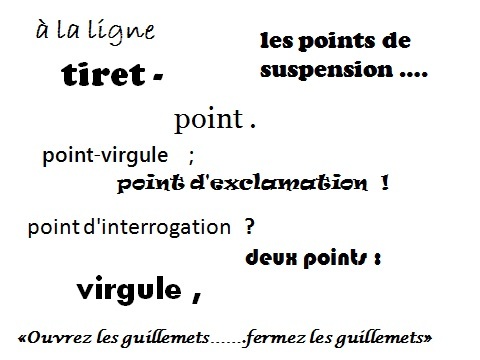 Her website has a wealth of resources for Spanish, German and French. Tower Hamlets SLN today! As promised here are the slides from today’s presentation which can find on the presentations page. You can find further links to some of the resources I mentioned in this posting about the ALL Cambs meeting in May. Here also is the link to the Cola cola Charter for football. 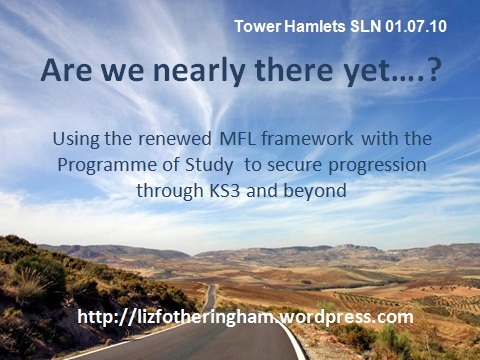 A PDF version of the MFL framework and the exemplification materials is available on the National Strategies site. You are currently browsing the archives for the Knowledge about language category.